After a friendship of several years with Sir Edmund Hillary, accompanying him on trips within Canada and the U.S.A., Mr. W. F. (Zeke) O’Connor was honoured in being invited as the Canadian representative on an expedition to the Mount Everest Base Camp in 1973, to commemorate the 20th anniversary of the successful ascent of Mount Everest by Sir Edmund and Sherpa, Tenzing Norgay. Mr. O’Connor has revisited Nepal each year since his first visit in 1973 to the present. Mr. O’Connor and a number of the Foundation Directors return to Canada each year with a deeper understanding of the many needs of the Sherpa people and a determination to further the efforts of seeking financial aid for the worthy projects underway in the mountain regions of Nepal. Emphasis is on involvement of the local community. 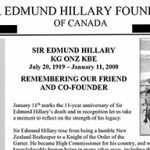 As a result of this groundwork, the totally Canadian The Sir Edmund Hillary Foundation (SEHF) began in 1974-75 and received its charter on October 1, 1976, and is registered as a charitable institution with its founder, Mr. O’Connor as President and Sir Edmund Hillary as Executive Vice-President. (1) Fully fund and operate the Kunde Hospital in the Khumbu Region of Nepal where an addition has been built and funded entirely by Canadian contributions. (2) To help provide medical assistance in the surrounding areas where health clinics have been built. These new health clinics and schools have been established with funds supplied by the Canadian Foundation and the Canadian International Development Agency (CIDA). (3) To provide assistance in the establishment of educational facilities and to promote instructions in methods of sanitation and matters related to health in general. Two volunteer doctors from Canada alternate every two years with two New Zealand sponsored doctors to take charge of the medical programs for the Khumbu area, operating out of the Kunde Hospital. Conservation: Reforestation is of prime concern, and our nurseries in the Namche area are producing successful seedling growth. Various environmental issues including pollution control are also currently being addressed. 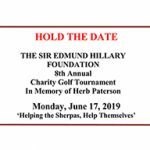 In addition the Foundation hopes to aid the agricultural program within the Solu-Khumbu area of Nepal and is aiming towards the improvement of methods of food production and the provision of supplies to the Sherpa people. A small reforestation program commenced in 1979 and a larger five-year reforestation program was initiated in 1981. As of this date, the SEHF have planted in excess of two million trees. In 1984 the SEHF responded to the ever-increasing need for reforestation in the Sagarmatha National Park by entering into a new five-year project with the National Park Department of Nepal. This was another CIDA approved project. The SEHF have finished a number of projects including the building and opening of the Khumjung High School. In April 1986 an eight-room middle school was built in the village of Karikola. The SEHF also did work on the monastery at Thamo and the rebuilding of the Phafting bridge. The SEHF funded the rebuilding of the Kunde Hospital, built a new school in Thamo, built thirteen medical clinics and will continue to respond to the needs of the Sherpas of the Khumbu area for many years. During Zeke O’Connor’s visits to Nepal in May 1985, 1986 and 1987, Sir Edmund and the Foundation were approached by the village Elders to take on a number of new projects including the stepped-up reforestation program in Sagarmatha National Park and additional school buildings in Chaurikarka and Karikola. 1987 saw the building of a school for young Tawas (monks) adjacent to the monastery of Thyangboche. January 1989 was a tragic date to the Sherpas of the Khumbu. On January 19, 1989, the Thyangboche Monastery and School were burned to the ground. This Monastery, situated at the top of the hill known by all trekkers in the Solu-Khumbu area with a direct view to Mount Everest, was one of the most beautiful spots in the world and the religious center for the Sherpa people. Sir Edmund’s Foundations from Canada, New Zealand, United States and Germany have all worked together, since 1989 at the request of the Sherpas, to help them rebuild their Monastery. The new building was completed and the formal opening held in September 1993. The Foundation started a scholarship program in 1997 to give financial assistance to local people to further their education in specialised fields such as medicine, reforestation and under this program, in 1997 we sponsored Kami Temba with a full medical scholarship at the University of Fiji. Dr. Kami Temba Sherpa completed his internship in 2002 and took over as the senior medical person, Chief of Medicine, at Kunde Hospital. Dr. Temba worked as a paramedic for twenty years at the Kunde Hospital.